When Clara Chong finished her script and Animatic edit for the Westpac Rescue Helicopter charity TV commercial I could immediately see the potential for this to be something quite visually special. Because she wanted make significant use slow motion I felt this would be an ideal project on which to test Sony’s new NEX FS700 (read the camera review here). When Nick Buchner from Sony told me that the camera was available and that they also had Metabones Canon Lens adaptor (more detail on that in the FS700 review) I was convinced that it was the right choice for the project. The script called for two different timeframes, a “present day” where the mother searches for her small child on an isolated beach and “flashbacks” of happy times together, each with their own distinct look. With outdoor location shoots, most of the cinematographer’s lighting choices are made in pre-production by influencing where and when to shoot which elements in relation to the changing position of the sun. With the added factor of shooting ground to air and air to ground in a helicopter that costs quite a bit to run, these issues take on an even greater significance. I knew there wouldn’t be much room for trial and error on the day. 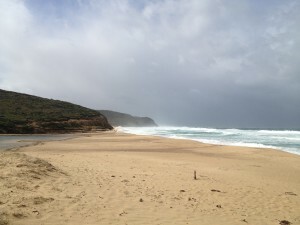 The double headlands to the North of Glenrock. It was important that the first day be our beach location day because if there were any insurmountable weather issues or if the helicopter became unavailable we would have the option of reversing the days and use Day 2 for the beach. With Clara’s schedule in Sydney not allowing for a pre-production day in Newcastle, I ventured back to my home town with a DSLR and my iPhone to do as much detailed prep as possible. First was a meeting with WRHS’s Justine Orton and Chief Pilot Mike DeWinton at the Westpac Rescue Helicopter base. Mike hadn’t yet seen the animatic edit and one of the things I love about the iPhone is that these sort of pre-production resources are always in your pocket! 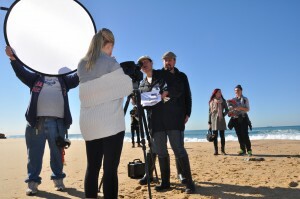 After seeing the animatic he suggested changing the beach location from Clara’s choice of Dudley Beach to the nearby Glenrock Lagoon. This would avoid causing problems with the noise of the big twin-jet helicopter buzzing around a residential are just before dawn. 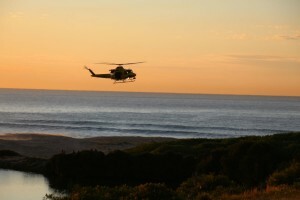 Added to this was the fact that the beach at Glenrock has some flat areas where it is practical to land the helicopter whereas they can’t land on the sloping beach at Dudley. With a quick phone call to Clara the decision was made. Although Glenrock lacks some of the dramatic rock formations that Clara was so keen on at Dudley, it is still a strikingly dramatic location. Mike and I discussed which direction and at what time the helicopter should approach the beach while looking at the Google Maps image of the area. I was keen that we we shoot the helicopter at dawn so that we would have dramatic light but with additional backup of being able to switch to dusk if we needed to on the day. Once you get to the end of the day you don’t have the morning as a backup plan! 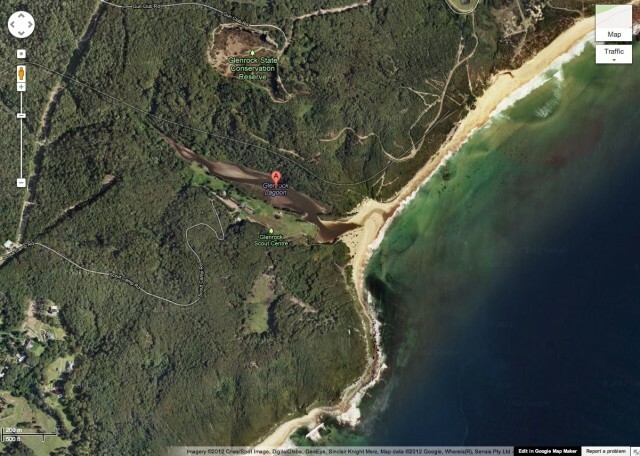 The Google Maps image of Glenrock Lagoon that we used to plan the helicopter’s approach. With this in mind I asked Mike to approach the beach from the East. This would give us a fairly neutral beach and sky background to shoot the chopper on the way in, so we would have one option in the can. Since sunrise was 6:23 am on the shoot day, Mike suggested that way plan to have the helicopter arrive at the location at 6 am so that he could land on the grassy area between the lagoon and the nearby Scout Camp to give us an opportunity to then plan precisely how to proceed and still get back in the air before sunrise. Sun Seeker image recorded on the location recce. After the meeting with Justine and Mike I drove to the location which is only about 20 minutes from the centre of Newcastle, despite it’s remote appearance. One pre-production tool that I rely on heavily is an iPhone app called Sun Seeker. It’s an advanced solar calculator that uses the GPS and orientation data from the iPhone to superimpose the path of the sun for a given date and location anywhere in the world over the iPhone’s live camera image. By pressing both buttons on the iPhone I was able to capture these images for later reference. The image to the right shows the sunrise information for the actual shoot day over the live image of the location on the recce day. The text to the right of the crosshairs displays the Elevation and the Azimuth of the crosshairs. 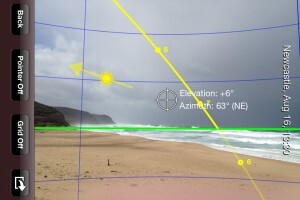 The green line is the theoretical horizon and the yellow line is the path of the sun on the given date and location. The dots along the yellow line are labelled with the hours of the day. With the helicopter arriving at 6 am, the sun would be completely below the horizon. Although this meant that the initial approach might be too dark to be usable in the context of the story I felt that this was worthwhile as it was only a backup for what we would shoot afterwards and I wanted the best light for the most carefully planned shots. It also meant that this would be available as a dramatic night shot for any future repurposing of the footage. I first started to really understand the power of using solar calculations when Ross Emery ACS presented The Matrix at a member’s screening for the ACS. The way he talked about the precision with which they planned shooting times for Second Unit stunt & FX work really made sense of using the sun as a light source by knowing where it was going to be, before it got there. The fact that it is now so easy makes it a great tool for all cinematographers. On the recce I also used the iPhone’s video to capture a nearly 360° pan around the location with a spoken notes for Clara to use as a reference in her planning. Call time for cast and crew was 5:30 am at the car park of the Scout Camp. 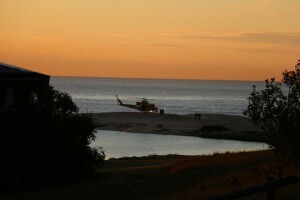 From there it was a 500 metre walk down to the beach and lagoon to be ready for the arrival of the chopper. The entire project was shot on a Daylight 5600° colour balance in 1080 HD at a base frame rate of 25p and using the FS700’s Cine-Gamma 1. The 24-105 zoom was the workhorse lens for the beach location. On the Super 35mm frame it gave a decently normal zoom range and the fact that it consistently maintained f4 throughout the zoom range was a big advantage when working quickly with the chopper. Because Clara would be editing the footage she was directing, we chose to work without a Clapperboard to mark the takes. As much as possible, I was setting exposure by light meter readings and in the colour grade this was again proven to be more accurate than the other methods. Sometimes when reacting quickly to the movements of the helicopter or when thrown an odd shutter angle by the FS700’s Super Slow-Mo function I was forced to use other methods. Because the camera’s Super Slow-Mo is limited to 19 seconds at 100 fps and 9 seconds at 200 fps, I chose to shoot all of the helicopter’s airborne footage at 50 fps. This also had the advantage of keeping the momentum of the flying and the motion of the rotor blades going while still having a slow motion feel. First shot after our discussion with Mike was another approach from the ground, this time with the chopper following the coastline from the north. Then Mike brought the Bell 412 around for an approach and landing so that Clara and I, along with behind the scenes cameraman Tim Cant could board the helicopter to then shoot the air to ground footage. Walking to chopper after shooting Tony Scott tribute shot. Although, the sun was already above the horizon giving us a beautifully side-lit approach shot coming down the beach, the fact that the chopper would be landing on a small rise on the beach meant that I was able to position the camera 170° West of the rise so that the helicopter would be fully backlit by the sun either just above or just below the level of the sand. With all of the careful planning and then a healthy dose of good luck, the sun broke over the sandy rise just as Mike brought the helicopter into a hover before setting it down gently on the sand. This threw up beautiful curls of backlit sand into the air below the helicopter. I could never have anticipated the full effect but by knowing where the sun was and where it would be going and having a clear plan with the pilot put us in the right place at the right time to let the magic happen. The next piece of incredible luck was that as the Crewman (also Mike) got out of the chopper to come and take us to the aircraft he walked in front of the machine and looked back at it. By this stage I had just switched to the Sony 18-200 lens which allowed me to zoom in and grab the moment. Once of the great virtues of shooting digitally is situations like this where you just keep rolling because it’s looking good and you know you can’t re-do it. The shot quickly got referred to as the “Top Gun Shot”, sadly by the time we were in post production it had become a little reminder of the passing of the great Tony Scott. Getting Airborne with the door open. In the air the 18-200 was great because of it’s optical image stabiliser and the having big wide angle and big telephoto in the same lens. The integrated lens hood also negated the need for using the clamp on mattebox which I wanted to avoid in the air as I didn’t want any risk of it coming loose and heading towards the tailrotor! I’ve spent a bit of time in Bell JetRangers and LongRangers but the bigger 412 is an even better platform for filming handheld from because of the ability to position a seat far back in the cabin next to the door giving a much better view forward as well as out the side while still remaining safely in the seat. The amount of space inside the 412 clearly gives away it’s lineage as coming from the legendary Huey. Luxurious overkill as a shooting platform but a rare treat for a cameraman. By backing off the camera’s ND filters I was able to close down the aperture enough that the main downside of the lens, it’s big variation in wide-open f-stop through the zoom range, wasn’t an issue. Depth of field wasn’t a concern since even at 30 feet above the waves everything was far enough from the camera to be on a very similar focal plane anyway. Once we’d shot the beach and actress Gemma Dawson from the air, Mike landed back on the grassy area beside the lagoon and shut down the chopper so that we could take a little bit of time to shoot the crewman carrying the rescued child into the helicopter. Framing was a bit of of a trick between not seeing that the rotor blades weren’t turning and not seeing that it had landed on grass instead of sand. I found one angle that worked and I actually quite liked by getting in close and low on the wide end of the 24-105 lens. Dropping a teddy bear @ 200 fps! Because we had a lot more flexibility with reshooting once the engines were off, I was able to make use of the FS700’s Super Slow Mo and crank the speed up to 200 fps. Using the end trigger allowed me to wait until we had seen the best of the action and then hit the trigger, knowing that it would record the previous 9 seconds. Once we had this shot in the can, we walked back to the beach and the helicopter got airborne again. Mike did one more approach down the beach and then gave us a final treat heading back to base. He took the helicopter out to sea to the East and then as he turned around I got an inkling of what he was about to do so started recording and following the chopper as it came directly towards us. As it approached the sandy rise where it had landed before, I noticed that the skids were actually hidden behind the sand… he was flying below the height where he had landed! As the helicopter got closer I tilted up rapidly, following the aircraft until it disappeared out of frame with the camera pointing straight up into the air. With no hope of spinning the camera around in time to get more useful footage, I finally took my eye away from the viewfinder and looked around to see the helicopter with it’s nose high in the air powering out of the valley. One moment when the cinematographer and aviation enthusiast in me were both equally happy! With the departure of the helicopter we took the opportunity to give the cast & crew a short break while we reviewed the footage. Our good fortune with at least three “magic” shots gave Clara the desire to rework her shotlist slightly so that she would be able to take full advantage of them in the edit. Back on the beach we started shooting the sequence of Super Slow Mo shots of Gemma as the distraught mum, looking for her lost child and the reacting to the dramatic arrival of the rescue helicopter. Initially we shot some extreme wides on the 10-22 Zoom. 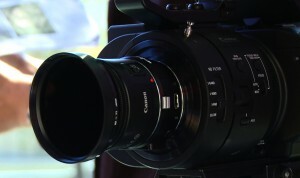 This is such a beautiful lens although it makes such a statement I did restrain myself from using it on too many shots. Back on the trusty 24-105 Zoom, we did more variations on searching, seeing the chopper and running after it. These variations were important in that they would give Clara the power to cut them together to expand or compress time in the edit and we knew this would be an essential part of making the emotional rhythms work at the same time as fitting into 60 seconds. For the big close up of Gemma at the emotionally pivotal moment I switched to the 50mm f1.8, clicked in 6-stops of ND filters in the camera and ran the ISO down to it’s native 500 rating. At 200 fps this gave me f2 in the direct sunlight. However, this light that had been working so well to give us shape and definition in the wide shots was now too harsh for the big close up. So we used one of those foldout portable reflector’s that can unzip the reflector to work as a diffusion filter. One great trick with using diffusion on a light source is that the position of the diffuser effectively becomes the position of the light source. This can be very useful in situations like this close up because, even though the sun was getting higher in the sky by the time we were doing this shot by having my assistant Dan Hoffman hold the diffuser closer to Gemma’s eye level, we still got a lovely side light which was also a much closer match what we’d shot before. To balance out the light loss with the diffusion I switched the ND’s back a notch and that left us back close to f2 again. I’m not always a fan of using shallow depth of field just because we can. It can be a very beautiful look but it can sometimes be distracting or disorienting for the audience. For this close though, I wanted to use the shallow depth of field to visually isolate Gemma’s character in that moment. Dan Hoffman hold the diffuser while Clara Chong checks the shot. The 50mm f1.8 is another beautiful lens. Even though it’s the cheapest one in the EOS range, the shallow f-stop and the 50mm focal length are a great combination for this sort of shot. I also find that when it is close to wide open it loses just the tiniest bit of sharpness, like an impossibly subtle diffusion on the lens, perfect for faces. It doesn’t appear to be colour matched to the L-Series but with digital grading that’s no problem at all. The one downside is that it is very much a consumer level lens in it’s build. Pulling focus with it is a challenge at the best of times but 50mm f2 at 200 fps is hardly the best of times for focus! That said, it is possible, it’s just not for the faint hearted! And you have to remember that if you get the focus right in half a second it will take 4 seconds to come into focus on playback. After this all that was left was a lot of running around on the sand chasing Harrison for the beach parts of the flashback sequences. For this I was back on the 24-105 and at f5.6, there’s not much hope of getting anything useably in focus at a shallower stop than that, with an energetic 3 yr old running around. For the “flashbacks day” we were in and around a nice suburban house for a good change of pace from the previous day. The mood on set was appropriately lighter without the time pressure of working around the helicopter or the emotional weight of the beach scenes. To avoid any risk of flicker coming into our Super Slow Mo shots I decided to limit myself to Tungsten sources for the day and avoiding any discharge sources like the Kino Flo’s or HMI’s that would usually be my first choice in this sort of setting. This actually became a positive thing when I remembered a trick I learned shooting and colour grading Albert’s Chook Tractor about ten years ago. An uncorrected tungsten light, when shot with a daylight balanced digital camera registers exactly the same colour as the last direct rays of sunset. By using tungsten lamps for backlight we were able to create a kind of soft, late afternoon glow while bouncing the natural daylight around when we needed to for key or fill and even using a bit of Negative Fill to stop too much bounce hitting the faces from below. With the knowledge that Clara and I would decide on the exact look for the flashbacks in the colour grade, I was confident that this style would give us plenty of room to manoeuvre if we needed it. Checking the look of the first flashback shot. Although the warmth of the backlight was largely lost in the final grade, the lighting still provided us with a really solid base from which to experiment and tweak. Despite the fact that we had a number of on set monitors to choose from, Clara prefers to look at either the on-board monitor when we’re in that mode or playback in the viewfinder, because this keeps her close to the actors and the action – allowing for a real connection in the directing. A coincidental upside of this is that it also allows for very fast and simple camera setups without cables going back to a “video village”. One flashback shot in the ad (boy on stairs) was done on the 10-22mm and the rest were a mixture of the 50mm or the 24-105mm but erring on the side of the 50mm when I could get away with it. We also used the handheld light diffuser on several shots, again using it’s capacity to both soften and change the angle of the sunlight. After we wrapped the shoot, we returned to the offices of Concept Creative, to record Gemma’s voice over in their booth. On each day we had no need for more than a single 16 GB SD card for the camera, although we had many more on standby. 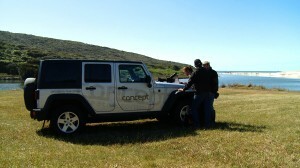 Concept’s Jay Cox data wrangled for us on location and ably recorded the voice over back in the studio. This shoot was an interesting mix of old and familiar as director of photography. New camera which was an evolution from one I’ve spent time with. Very familiar lenses, director and crew. As much as possible lighting and setting exposure film-style with a light meter and totally winging it when needed. The big thing that strikes me from this shoot is that we’re at a point where cinematography is starting to come full circle in the sense that camera choice is a matter of prioritising frame size, available frame rates, lens options, on set functionality and “lab” workflow – ie. ease of post production and personal preference. In fact, I found myself spending surprisingly little time thinking about the camera on this shoot. And that’s very good. On a good shoot, or more so on a tough one, the last thing you want to do is be stuck obsessing about that box on top of the tripod. The NEX FS700, like so many of the new digital cameras has one vital but unspecified feature – it just doesn’t get in the way of the cinematographer’s craft. That alone, is no small thing.